Homemade Freezer Meals: Cooking tips techniques recipes and more. Dinner's a breeze with freezer meals freeing up your evenings. Simplify your life, or at least your mealtime routines, by keeping your freezer stashed with homemade meals that even your kids want to eat. Freezing food is the easiest method of preservation, keeps food closest to it's natural texture and flavor without needing additives and this simple technique of making meals ahead can get you eating real food with your family again. Plus, since your meals are frozen they wait for you, unlike the food in your fridge that can go bad behind the milk or if your meal plan gets delayed by a day or two. This site is your guide to freezing food, freezer cooking and meal planning with recipes, instructions and tips on saving your hard earned money and your most precious asset - your time. Freezing food ahead allows you to save time, money and be healthier eating homemade meals with simple from scratch recipes. It’s a bold statement, I know, but it’s absolutely true. Let’s face it; we’re all busy, we all know we need to eat better and we all know that good food and quality meals are essential to a healthy lifestyle. Pulling a meal out of the freezer is faster than the drive through, delivery or your favorite eat in restaurant. Homemade meals are cheaper than eating out and since you control all the recipes and ingredients you can rest assured that your family is eating healthy food. But how can we get home cooked meals made without quitting our jobs or going insane? My solution is to prepare homemade from scratch meals when I have the time and freeze food for later when I don‘t have the time, energy or desire to cook. So drive past the line at the drive through, put down the phone, step away from the boxed entrees in the grocery store and get a healthy homemade dinner on the table. What Can You Find On Favorite Freezer Foods? This site is all about freezing food and all it’s nuances. That includes meals and recipes that freeze well, cooking tips and advice and more. Whether you’re new to freezer cooking, a seasoned OAMC (once a month cooking) veteran, looking for new recipes for a supper swap or an overwhelmed novice just learning to freeze food you’ll find what you need. Let’s start with a quick and easy guide to help you navigate your way around. 1) Get started learning how to freeze food. This section is your guide and reference. 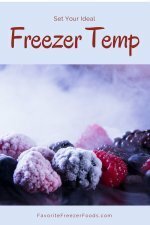 Learn the proper freezer temperature, how and why to keep an inventory, what foods freeze well, what containers to use, how to thaw food and a everything you need to know to start freezing meals ahead. 2) Find recipes that freeze. I don’t believe in secret recipes, any recipe worth bragging about is worth sharing. 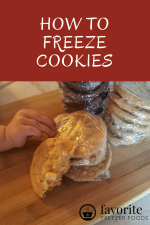 Every recipe on my site is freezable and has or is linked to detailed freezing, thawing or reheating instructions. Sure I could share recipes that can’t freeze but you can find those anywhere. I do my best to include variations for those who want to try a new twist on an old favorite or are looking for gluten free substitutions and welcome your suggestions for new variations as well. Share your own freezer friendly recipes; tell us how you adapted your family’s favorite dinner into a freeze ahead meal or tempt us with your scrumptious sides. Share the best tips and techniques you use to freeze food. Do you double meals and share a frozen batch with your elderly parents when you visit them Sunday nights? Make an extra serving to freeze for your college kid? Freeze brown rice ahead and microwave on busy weeknights when you don’t have to time to cook it fresh? We wanna heard all about it! Get updates and articles right in your inbox! You’ll also receive a free printable freezer inventory sheet as my gift to you when you sign up. The inventory sheet helps you track what is in your freezer without even opening the door. This way you don't waste your freezer meals or all the hard work you put into them! Freezer Inventory. Organize your freezer meals so nothing gets lost and forgotten ever again. Know what's in your freezer without even opening the door. Cookbook reviews for the home cook with emphasis on make ahead and freezer cookbook reviews. Quailty freezer containers are the single best investment you can make to protect your freezer meals. Learn about the different types of containers and when to use them. Instructions for freezing foods and free recipes for freezer meals. Favorite Freezer Foods blog. Favorite Freezer Foods ezine about freezer cooking, meals, recipes and more. Who's behind Favorite Freezer Foods? Favorite Freezer Foods policies about advertising and disclosures. Get answers to your freezer cooking questions! Discover mouth-watering freezer recipes submitted by visitors or shar your best freezer meal recipes here. Meal Planning Ideas | Simple tips and practical advice to make dinner time easily, saving your time and your precious sanity. Learn about the nutrition of frozen vegetables, how to freeze them at home and discover freezer cooking recipes for vegetables. Frozen bread and baked goods. Recipes for homemade bread and instrutions on freezing bread. Homemade soup recipes that are great for lunch or dinner with a sandwich,a salad or by themselves. Freeze soup is single serving portions for any meal. Diabetic Dinner Recipes | Recipes that you can make ahead and freeze for people with diabetes. Also find information on freezing food, book reviews and more. Quick and easy chicken recipes you can make now or freeze for later. Simple homemade marinade recipes are known as "dump" recipes in freezer lingo. Making your own marinade sauce is easy. There's no need to buy expensive marinades or that are full of preservatives. I love quick easy cookie recipes. Check out my favorites, share your own and see what cookie recipe variations others share. Everything you need to know to cook a delicious turkey for a holiday meal.